I wish I had gotten more than one bottle of this when we were at the winery last November. It was one of those wines that you get upset as you drink it, because you know you can’t get another one. Once again my job as store manager of a wine shop has provided me the opportunity to taste some fabulous wine. About a week ago, we opened up the 1999 B.R. Cohn Olive Hill Estate Cabernet Sauvignon ($96) to see how it was drinking. Well, I am here to say that it is drinking extremely well right now, as it should I guess for almost 100 bones! B.R. 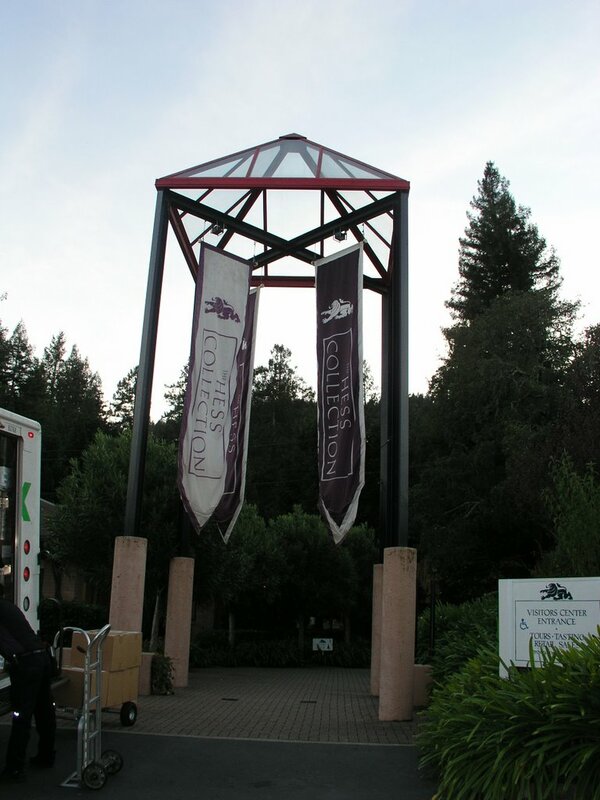 Cohn was founded by Bruce Cohn, who was road manager for the Doobie Brothers and is located in Glen Ellen, California in the heart of Sonoma County. The Olive Hill Estate Cab is their premium released wine and thus their most expensive. Also B.R. Cohn has a great PR video on their website and YouTube, check it out below. Not a whole lot of production information on the wine other than that it spent 18 months in French Oak barrels and that it is 13% alcohol. This wine was killing it, and kept getting better and better revealing more and more flavor notes. I feel it is at it’s prime, but with the structure and fruit that the wine exhibited it will still be going for another few years. Of course I always have a hard time paying $100 for a wine, but this wine is extremely well balanced, structured, elegant yet powerful and already aged for ya. If you can find a bottle and want a great wine for a special occasion, pick it up. We visited Kaz Vineyard and Winery on our first day in Sonoma and it was by far the smallest winery that I have visited in California. Producing around 1000 cases on average, Kaz focuses on small lot bold red blends and unique grape varietals all with their own zany Kaz twist. Owner and winemaker Richard Kasimer (Kaz) says this is a complete family operation, with some part of the winemaking process is handled by a member(s) of the family, right down to the website. Despite Kaz’s crazy persona, his wines are no joke. 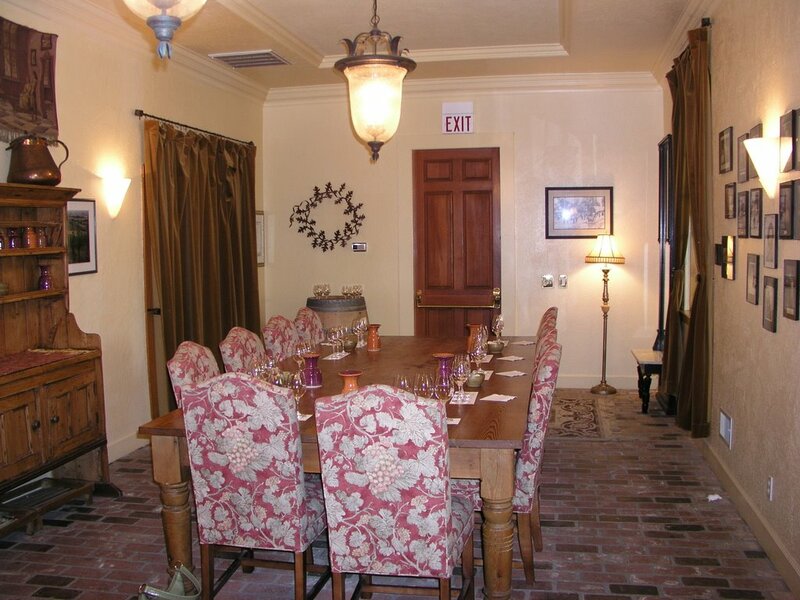 Kaz is located in the beautiful Valley of the Moon, in the heart of the Sonoma Valley. During our visit both Kaz and his son were on hand to take us through the tasting of 12 of their hand crafted wines. White Port (Chardonnay) – nice almond, vanilla and butterscotch, yum! We enjoyed all the wines in the line up and it was an extreme pleasure to taste with Kaz and his son. Kaz is a hoot to taste with, a total ball of energy that could get even the casual winery goer fired up! After we tasted, Kaz walked us around the facility, Megan and I even got to punch the cap on some fermenting Zin. 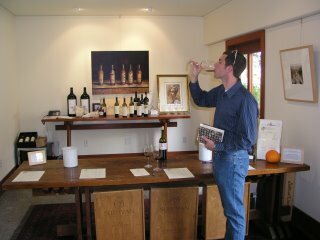 Next time you are in the Sonoma Valley make to take time and taste Kaz’s small artesian wines. You can also check out Kaz on Wine Biz Radio with friend and show host Randy Hall. After the Wine Bloggers Conference finished up on Sunday, Joel Quigley of Paige Poulos Communications invited us up to C. Donatiello winery in the Russian River Valley for a private tasting. On hand to taste were Joe from 1WineDude, Lenn from Lenndevours, Becky from Smells Like Grape, Nick from Wine Scholarship, Thea from Luscious Lushes, Megan from Wannabe Wino, and Patrick from Oenophilia. 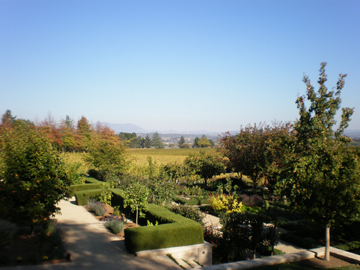 Upon arriving, the first thing we drank in was the beautiful gardens and views that surround the winery. We were then greeted by Chris, the “C” in C. Donateillo, in their private tasting room. 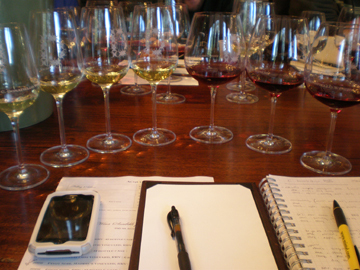 Laid out before us was a magnificent spread of 7 wines, a tasting pad, and a glass of water ready for us to taste. 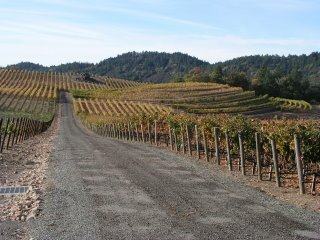 The winery is located in the “cradle” of the Russian River Valley (RRV), and is highlighted by their certified organic Maddies Vineyard that is located in the Middle Reach of the RRV. Surrounding the winery are beautiful gardens and fountains that include a magnificent aroma garden. The organic aroma garden was created specifically with Pinot Noir and Chardonnay in mind, and contains a plethora of flora reflective of the aromas found in these two wines. For a sensory geek like me, walking through this garden with a glass of Pinot Noir in hand was truly a magical experience. Check out the great video that Lenn shot of Chris explaining the details of the aroma garden. 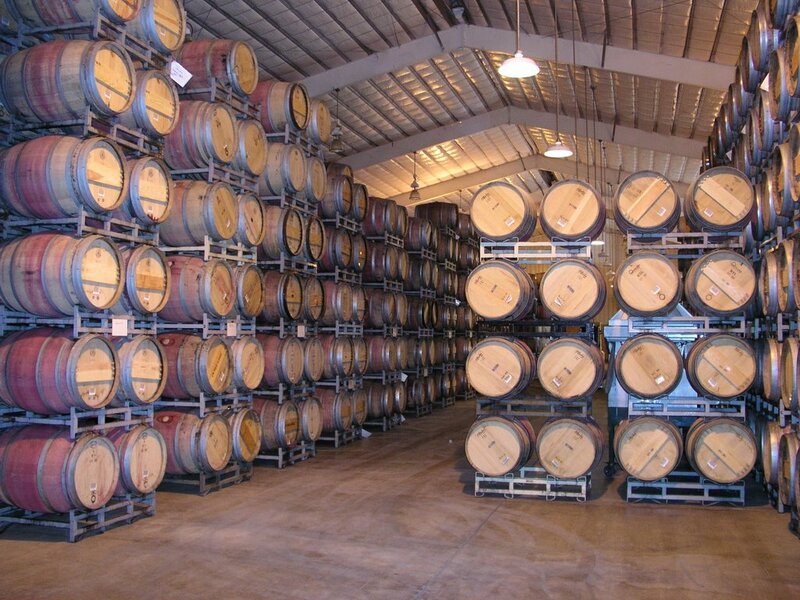 The winery produces about 6,000 cases from their state-of-the-art gravity flow production facility. 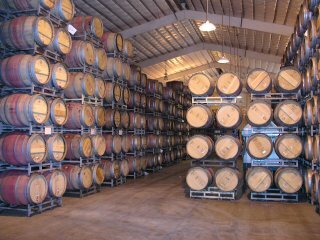 They produce primarily Chardonnay and Pinot Noir, but also produce a small amount of Sauvignon Blanc and Rose that is only offered to wine club members. Sauvignon Blanc (aged in neutral oak barrels) Nose: citrus, hay and grass. Taste: apricot, stony fruit, with green apple on the finish. 2007 Christie Vineyard Chardonnay (aged in neutral French Oak) Nose: oak, vanilla, apple. Taste: apple, spice, nutty almond, hint of butter on the finish. 2006 Orsi Vineyard Chardonnay (20 yr old vines, 60% aged in 50% New French Oak for 8 mos.) Nose: fairly tight with citrus, mineral, and granny smith apples. Taste: apple, nuttiness, light toast, fresh hay and lemon rind. 2006 Maddies Vineyard Pinot Noir (10 mos. in 50% new French Oak) Nose: very floral mostly of rose, raspberry, sage, and cranberry. Taste: undistinguishable bright red fruit, hint of chocolate and plum. Very nice mouthfeel and dry finish. 2006 RRV Pinot Noir (10 mos. 40% new French Oak) Nose: allspice, cherry. Taste: allspice, raspberry and wheat toast, bit of pepperiness at the finish. 2006 Floodgate Vineyard Pinot Noir (10 mos. 50% new French oak) Nose: rose, leather, earth. Taste: cherry and red currant. Of all the wines my favorites were the Orsi Vineyard Chardonnay and the Maddies Pinot Noir. I purchased the Pinot Noir to take home and cellar for another 2 years or so. In addition, Chris gave us all a bottle of their Rose to take home and enjoy. After our tasting, Chris took us around the property and showed us the rest of the facility as we sipped and enjoyed some more of their wines. Thanks to both Chris and Joel for a fabulous end to our weekend in Sonoma. Also sorry for the cheesy title, it was all I could come up with, haha! Having had the Sauvignon Blanc from Pedroncelli a couple of times, and liking it quite a bit, I was excited to see that the California Wine Club sent me some Pedroncelli wines to review, both of which I have never had. The one I decided to try first was the 2004 Dry Creek Valley, “Family Vineyards”, Petite Sirah. Currently operated by 3rd generation Pedroncelli’s, the winery is located at the Northern border of the Dry Creek Valley appellation in Sonoma County. Growing grapes and making wine since 1927, Pedroncelli now has an annual production of around 60,000 cases. Trying to stay regionally as well as terroir focused with their wines, whatever isn’t sourced from their 101 acres of estate grapes comes from vineyards within a ten to twelve mile radius, a lot of which are owned by relatives. Harvested in early September, the grapes were aged in both French and American oak for 13 months after fermentation in stainless steel tanks. 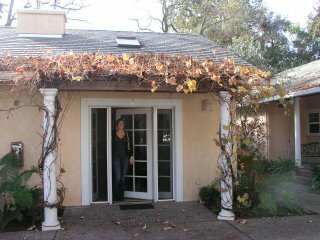 The wine garners the “Family Vineyard” designation because the vineyard, which has been provided grapes to the winery since 1940, is owned and managed by the Pedroncelli’s niece, Carol Bushnell. Megan and I drank this with our ultra good, super gigantic Stromboli from Candelas and I have to say this is a great pizza wine. Very rich, with lots of fruit and the right amount of tannins at the back end that snap your palate back into reality from the fruity, chocolaty goodness. Decent acidity keeps the wine from being to overbearing with it’s richness but this wine is definitely for fans of New World style wines. That being said, it is made in the style, that I feel, is what Petite Sirah should taste like and I was very pleased with it. From what I read on the Pedroncelli website and what the flyer from California Wine Club said, this is no longer available from the winery and is very hard to find so I feel lucky that the CWC sent it to me. If you’re in the mood for a fruity, rich, hard to find Petite Sirah check this one out. I think even if you are not in the California Wine Club you can still buy wines from their website, and it looks like this one is on sale for $10.99 (just checked), not bad. Moon Mountain Vineyards (not the original name) has a long history of being bought and sold, including various name changes that date back well into the early 1900’s, to the beginning of Sonoma Valley’s winemaking history. 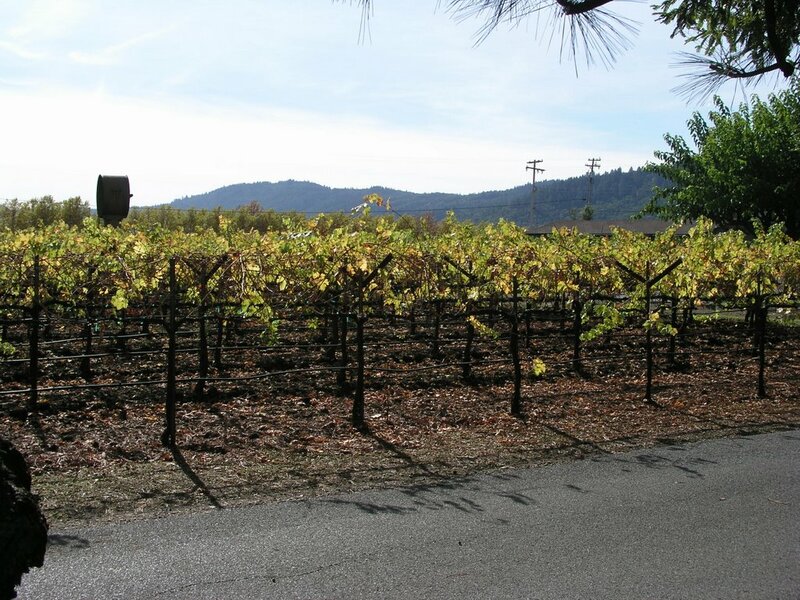 Farmed primarily for Cabernet Sauvignon grapes in the 70’s, the grapes were sold to big name wineries such as Ridge, Kistler and Chateau St. Jean. A winery was not built on the property until the early 80’s where they focused on making Bordeaux varietals that they found grew well in the soil types that exist in the Mayacamas mountain range. Owned now by Diageo, the winery and vineyard focus on making wines via sustainable if not organic farming practices. 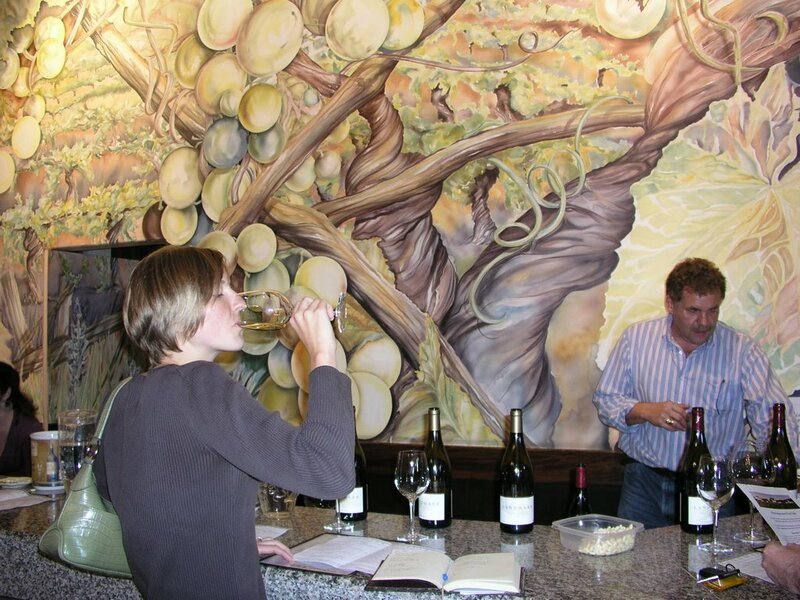 All of the wineries planted 73 acres of the 286 that make up the estate are certified organic. 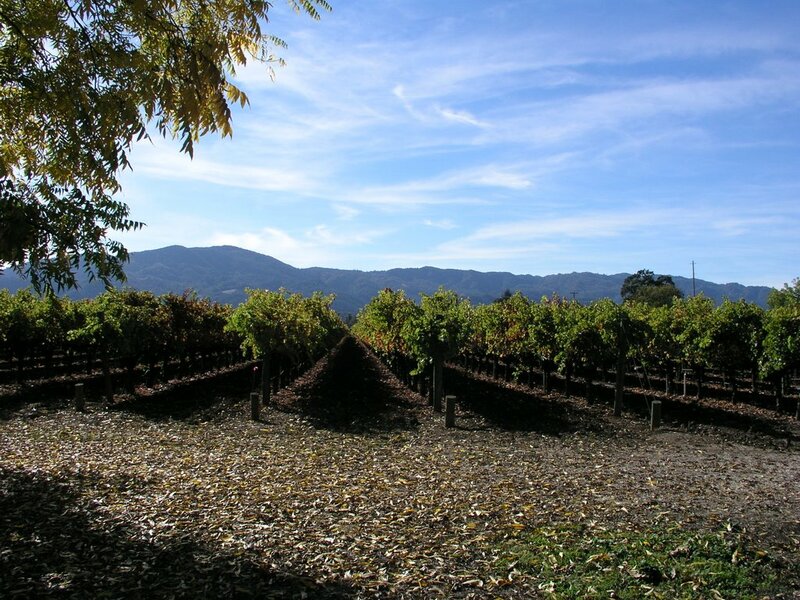 For non estate wines they choose vineyards that follow the same sustainable vineyard practices as they do, although these other wineries may not be organically certified. The 2005 Moon Mountain Cabernet Sonoma County ($15) comes from 6 different vineyards (32% Knights Valley, 23% Chalk Hill, 21% Dry Creek, 15% Russian River, 7% Alexander Valley, 2% Sonoma Valley) throughout Sonoma County. Composed of 91% Cabernet Sauvignon, 7% Merlot, 1% Cabernet Franc and 1% Zin, the wines sees 18 months in 100% American Oak, 30% of which is new. We had this with a grilled portabella mushroom stuffed with roasted red pepper, fake sausage, pine nut and thyme stuffing, topped with feta cheese and a balsamic glaze along with some rosemary redskin mashed potatoes. The wine went really well with the slightly charred, grilled and earthy flavors of the mushroom along with the “meatiness” of the stuffing. 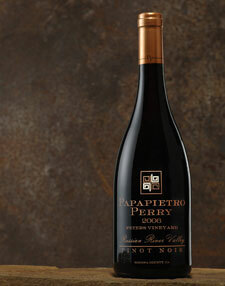 It had nice dark fruit aromas and flavors up front that were rich and inviting. It took about a half hour for the wine to start showing the nuttier and herbal characteristics that provided welcome layers and a more intriguing flavor profile. This was a good Cab, especially for the price tag of $15. I could definitely see it going well with pizza or other lighter meat dishes that incorporate roasted veggies and fungus! Megan and I picked this up just over a year ago, on our first day of our 2006 Napa/Sonoma Trip. This was from the limited release tasting that we participated in, that I highly suggest you do if you give Ferrari-Carano a visit. 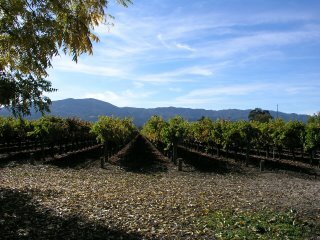 The 2003 Sangiovese was made up of 96% Sangiovese and 4% Syrah all from the Alexander Valley. After a 10 day maceration period, the wine was aged in 20% New French Oak and 80% 2 year old French Oak for 16 months before it was put into the bottle and allowed to age for another 6 months prior to release. This was a fantastic wine, just was we had remembered. Even though it was a 2003 and it drank great, I feel it was still a bit tight and could still go another year or two. We decanted it, and after about an hour and a half was when the more fruit driven aromas and flavors started to shine through. At around $32, it isn’t any every day drinker, but it is a really well made wine for the price. So back in August I posted about the optimism for the 2007 Napa vintage. 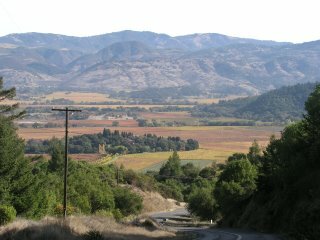 (Click here to read that one) A new article on Wine Business dot com gives the same great news for the Sonoma 2007 harvest. Check out the article. We received this bottle in one of our wine club shipments from Seghesio. 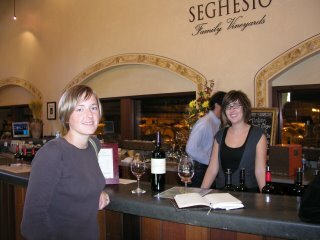 Seghesio has a great tasting room in the heart of the Sonoma Valley just outside of Healdsburg. 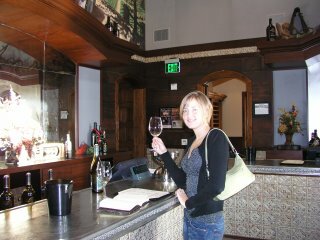 We made a stop by there tasting room the last time we were in Sonoma, and decided to sign up for the wine club. Click here for my review of that visit! As the name would imply, the wine is made from old head pruned vines from vineyards in both the Alexander and Dry Creek Valleys. The 2005 growing season was relatively cool and provided a long period of time for grapes to develop slowly and maturely. The grapes were harvested from the end of September to the 1st week of October at a nice high Brix (sugar content) of 26.4. The 2005 Old Vine Zin saw 12 months of barrel aging in a mix of 75% French and 25% American oak, after 10 days of maceration with a final alcohol level of 15.3%. Stay tuned in the future for more wine reviews from Seghesio. We feel bad when we drink the ones that they only distribute from the tasting room or to the wine club, so we hold to them as long as we can. Megan and I received this wine as part of our Imagery Estate Wine Club shipment earlier this year. Each shipment contains two bottles of wine that are usually only offered at the winery (as was this Merlot) and get four shipments a year. 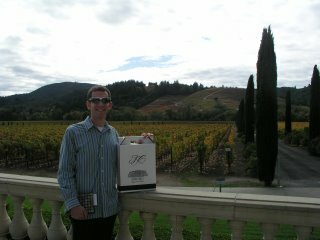 We visited them when we were on our Napa and Sonoma trip at the end of last year and had a great time. It is a beautiful place to visit, with an excellent tasting room and staff, and an awesome patio for enjoying a picnic lunch. 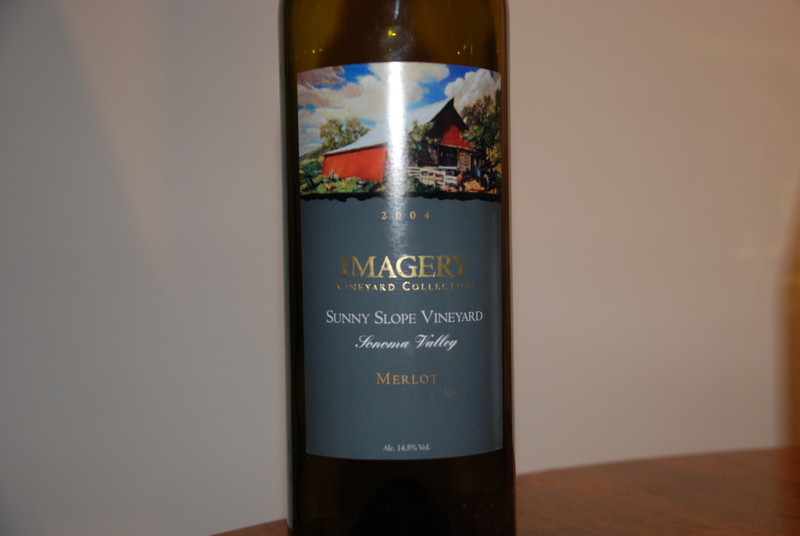 Some information on the wine: The Sunny Slope vineyard that these Merlot grapes are from is quite interesting. The site that the vineyard is on is pretty much an old rock quarry and the vines were planted in holes drilled or pick axed more than 20 years ago. The vines get a great southwest exposure that produces a ripe, concentrated, thick skinned grape. 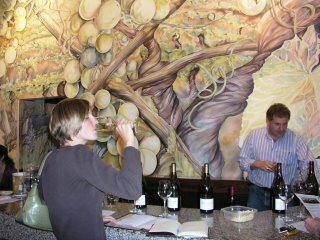 The 2004 vintage was dry overall, in fact humidity levels at the end of the season dropped well below the average 30%. (Geez, I wish the humidity around Richmond would average 30%) Proper vineyard care and patience prevailed in allowing the grapes to develop their wonderful flavor, even though sugars were rising prematurely. I believe the wine, without the 15% member discount, is $38. This was a delightful Merlot, and unfortunately I didn’t write in my notes what we drank this with, and I can’t remember since it was a couple of weeks ago. Since this is only distributed from the winery, you can’t run to your local wine shop and pick it up. But, if by chance you are in Sonoma, give them a visit, you won’t be disappointed. the tasting room to say hello, what an experience. fruit flavor, extremely smooth and a nice chocolate finish on the back palate. only making around 8000 cases (maybe 6000 my note scribble was a little fuzzy). 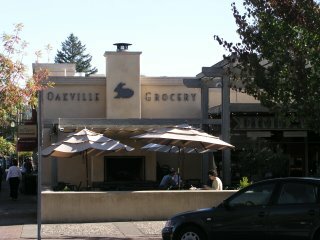 another definite recommendation for a trip to Napa. palate for more wine tasting. 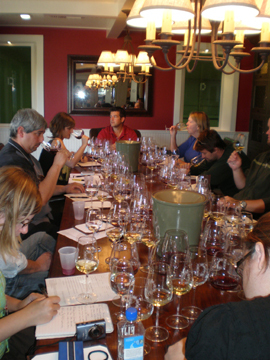 is fun, because it is always fun to discuss the wine with more people around. because we were poured the 2003 Special Selection, and holy cow was it amazing. stretches over the mountain they have vineyards both in Napa and some in Sonoma. Chardonnay. 2005 Cabernet Franc was next, it was 75% Cab Franc and 25% Cab Sauv. black raspberry, tobacco, and cinammon notes with very long finish. Really outstanding. with lots of floral notes and the sweetness wasn’t overpowering or cloying. For the day we took home the Cabernety Sauvignon and the Cabernet Franc. The views from Pride are great, the tasting room staff was fun and jovial, and the wines were fantastic, truly a don’t miss on your Napa trip. They do require an appointment also, but again don’t let that scare you off. Chardonnay, a really fun well balanced Chardonnay that we can’t wait to drink. is awesome, and the grounds at Hess are really worth seeing as well. was quiet and cozy, just what we needed after a long day of tasting. 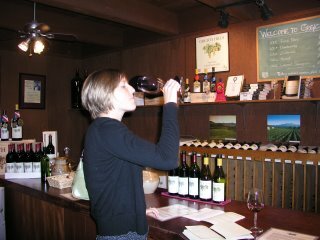 Megan and I just got back from Napa/Sonoma valleys, where we had an awesome trip exploring tons of wineries and loving every minute of it. The next few blog posts will outline our 3 days there and will have lots of pictures and information about all the wine tasting that we did, as well as about our cottage we stayed in and the restaurants were we dined. ENJOY! 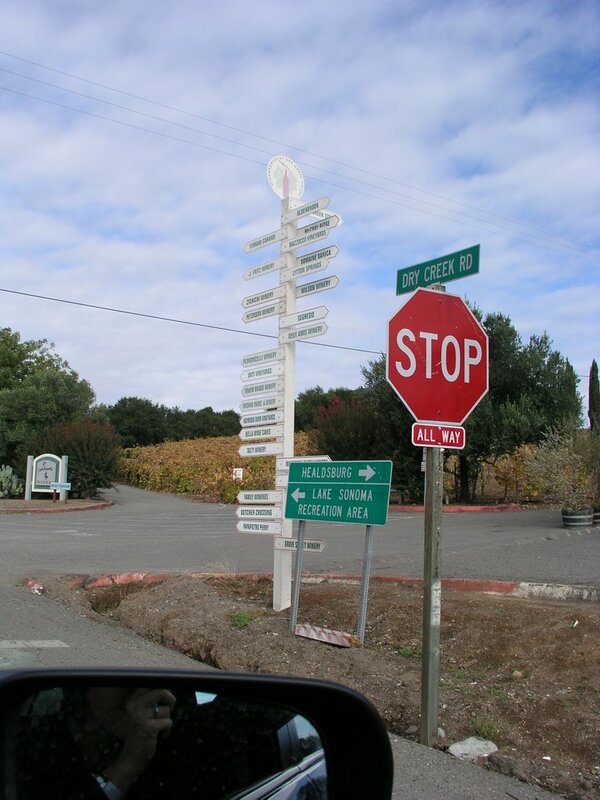 which way to Ferrari – Carano? 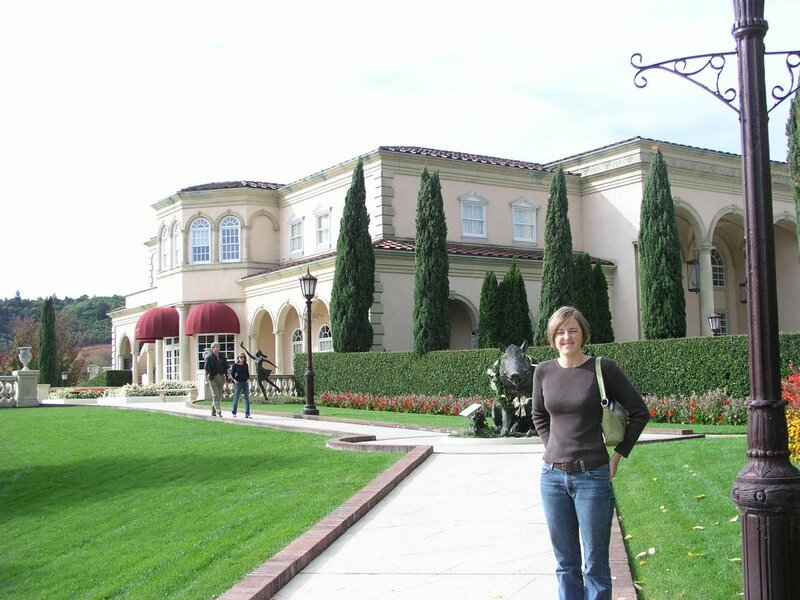 Stop 1 – Our first stop of the day was Ferrari – Carano (you might have heard of it). As you can tell from the pictures below, their winery is palatial. Upon entering the tasting room we discover that they have two tastings, one for $5 dollars that tasted most of the wine they regularly distribute and then a $15 dollar tasting of wines down in the barrel room that includes reserve wines and wines that only go to wine club members and or tasting room patrons. We opted for two of the $15 tastings and split the list of 8 wines. The room that the tasting was conducted in was beautiful and adjacent to one of their barrel rooms, with lovely wood furniture and ornate iron chandeliers. Here is a list of what we had for tasting 2005 Sauvignon Blanc, 2004 Forella Chardonnay, 2004 Tre Terre Chardonnay, 2004 Reserve Chardonnay, 2003 Zin, 2002 Syrah, 2003 Sangiovese, 2002 Tresor. All of these wines were fantastic but I will comment on the 3 we purchased all of which are not distributed to the east cost for wholesale. The 2005 Sauvignon Blanc was great and is different from their Fume Blanc you may have seen on the shelves, and includes in addition to the Sauv. Blanc a bit of a Muscat Clone. It offeres great apricot and floral notes with peach and honeydew following in the mouth, with a very smooth mouthfeel and not as tart as some Sauv. Blancs. Our 2nd favorite/purchase was the 2003 Sangiovese which is completely dry farmed for that extra umph. It was delicious with blueberry, blackberry toast with a nice slightly spicy finish. 3rd favorite/purchase and these are not in any order of preference (just of how I wrote them down) is the 2002 Tresor which is a blend of primarily Cabernet Sauvignon, and Merlot with Cab Franc and Petit Verdot in the mix as well. The 2002 Tresor had 20 months in oak and aged 24 months in the bottle. Cocoa and Eucalyptus on the nose with a yummy taste of blackberry and raspberry layered nicely with a mild earthiness and a smooth tannic finish. It was an awesome wine!! Megan and I both definitely recommend the extra money for the reserve wines, they are all amazing and most are hard to find on the East coast. 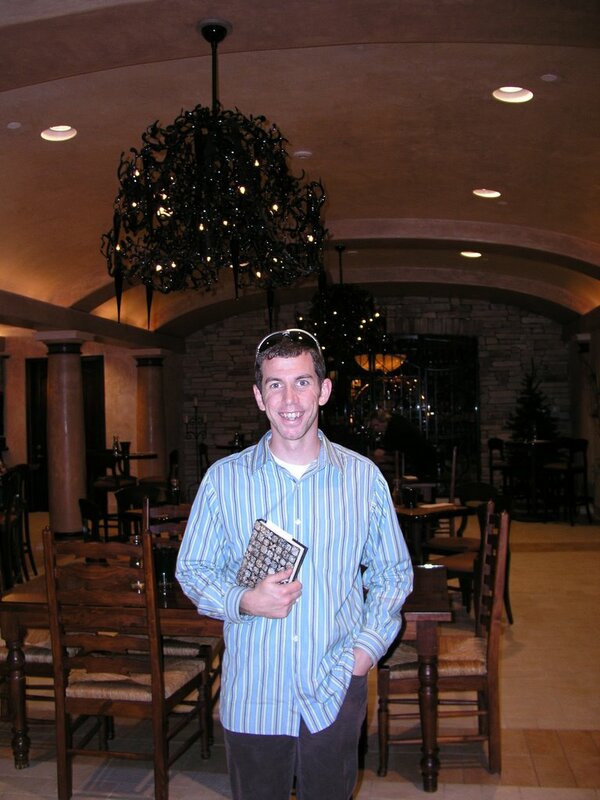 Yoakim Bridge is a small 2000 case winery (so everything is sold from the tasting room or wine club) in the Dry Creek Valley, just a ways down the road from Ferrari-Carrano. They have estate grown Zin and purchase all of the other grapes from local Dry Creek growers. The winemaker and owner is David Cooper who does everything in the winery by himself which is truly amazing. 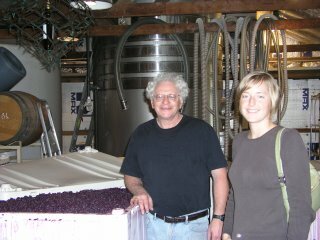 Check out the picture below of Megan and David in the winery, where he is displaying his beautiful Cabernet that is needing another punch down. David only has red wine and they are all fantastic. For tasting were the 2002 Zin, 2004 Merlot, 2003 Cuvee (Cab. Franc, Merlot, and Cab Sauv.) 2004 Cabernet Sauvignon, and 2002 Syrah. 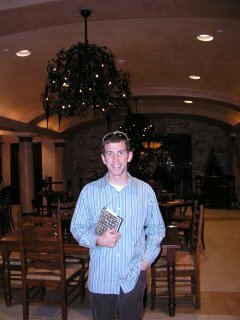 Our favorite and purchase from Yoakim was the Zinfandel. Beautiful with spicy raspberry that wasn’t too jammy, great chocolate and long finish. The Zin was estate grown, and blended with 6% Cabernet Sauvignon from Wallace Creek Vinyeard. Seghesio is another winery that most of you have probably heard, and there Sonoma Valley Zin is usually a staple on a lot of wine lists. 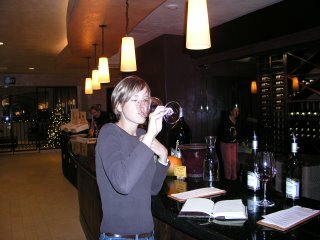 Well Seghesio was tasting 5 wines that day, but we got to taste a few extra due to our enthusiasm and great discussion we were having with the tasting room associate who was a Seghesio herself (daughter of the current winemaker). Again, all of the wines we tasted were fantastic and here is a list of what we tasted. 2005 Pinot Grigio (light fruity and crisp), 2004 Costiera Pinot Noir (blackberry, cherry, not too earthy), 2004 Sangiovese (spicy, tobacco and earth), 2004 Cortina Zin (jammy dark fruit, spicy followed up with cocoa) and the 2004 Old Vine (black raspberry, not as spicy, smooth). Those were the 5 wines that everybody got, the next 3 are ones that we got to taste special – 2004 Saini Zin (similar to the Cortina, with lots of rich chocolate and raspberry), 2004 Home Ranch Zin (1896 Vines, smoother than the other zins, still spicy, with jammy dark fruit flavors), and 2004 San Lorenzo which wasn’t even for sale (a great wine probably the “lightest” zin of the bunch, a great Zin for beginners. Seghesio was great and all of there wines were fantastic, we signed up for their wine club so we will be getting 2 bottles qtrly. 2 of which are already on the way. Yummy. We also ate our lunch at Seghesio with a nice bottle of water due to all the wine we had been having (I needed to drive some more haha). 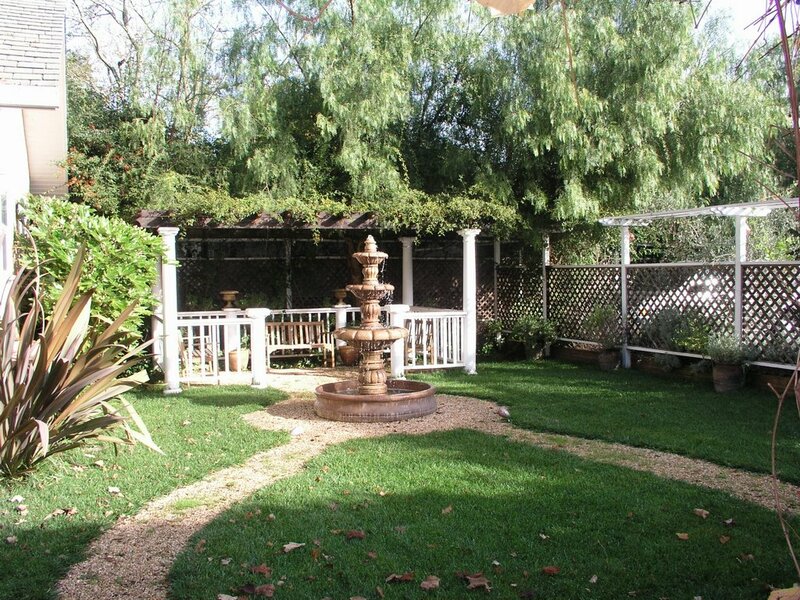 They have a beautiful picnic area and it was a beautiful sunny California day. 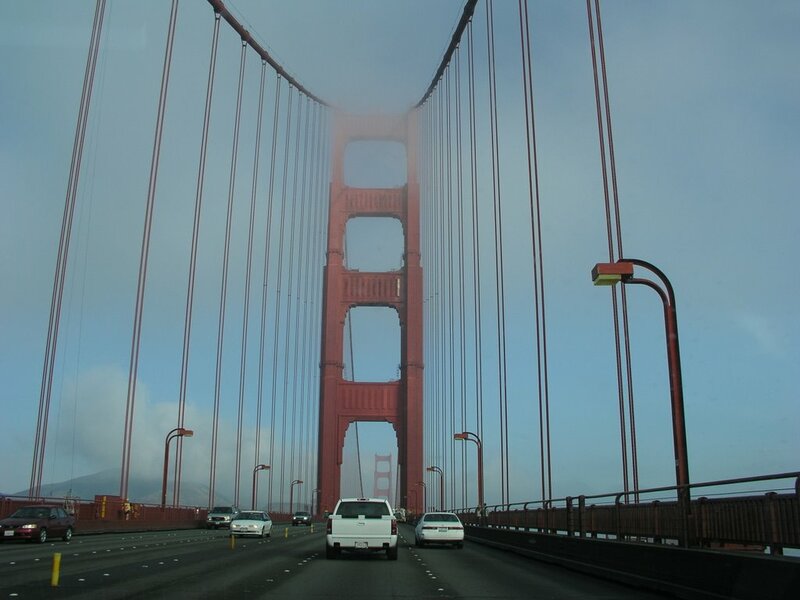 We hit Landmark was me made our way South through Sonoma county towards the Glen Ellen Inn. Landmark is most famous for the Overlook Chardonnay that you might have seen at Costco. Our favorite and the bottle we purchased was the 2004 Damaris Reserve Chardonnay. It was lovely with nice light fruit aromas accented by apple and pear with a great taste of hazlenut and caramel, a truly yummy chardonnay. Our other favorite was the 2004 Syrah that was completely organic. It seemed lighter than most Syrah’s (which we like) and was filled with aromas of black raspberry, a smooth mouthfeel and a spicy finish. Landmark is farely small by California standards producing around 15,000 cases. They have beautiful surroundings and are a great place to have a picnic. (although we didn’t). We headed on down the road to Glen Ellen which is about 12 miles North of downtown Sonoma. 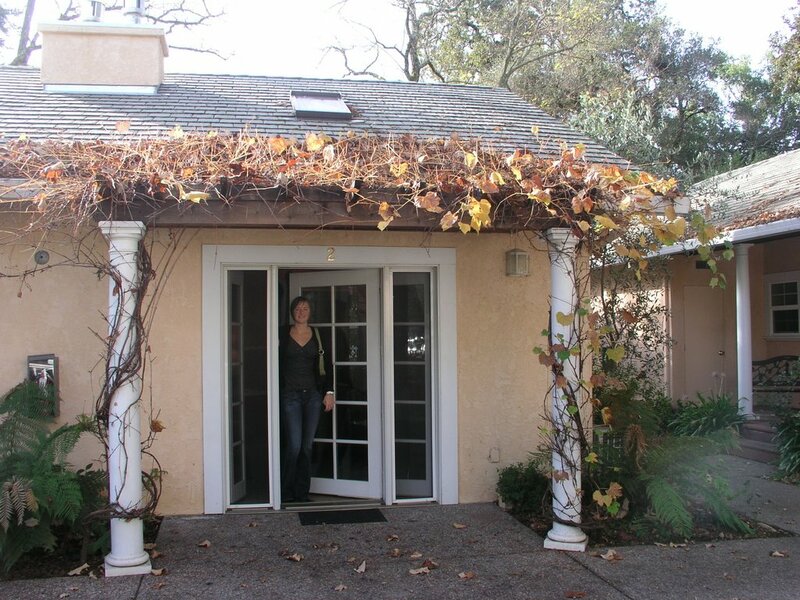 We had eatin at the Glen Ellen Inn last year when we were in wine country and remebered that they had six cottages out back along the creek for guests to stay. You check in at the bar in the restaurant and get your key. We were in Cottage number 2. 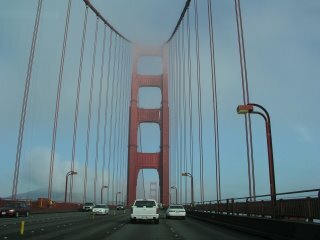 Check out the pictures below, isn’ t it awesome. That night for dinner we dined in the downtown Sonoma at the Girl and Fig, a great cozy restaurant that focuses on fresh local ingredients which is always great, especially when you are a vegetarian. I definitely recommend them, and they are a well known fixture in the Sonoma Valley. All of the wines that we purchased on the trip were wines that you are not able to purchase back in Richmond. So even if we went to larger wineries we purchased the small lot stuff, that we knew would be a special addition to our “wine cellar”. All in all we came home with 2 cases of wine, stay tuned for Days 2 and 3 to come in the next week.